The constellation Coma Berenices. Roll mouse over to see labels. Coma Berenices is a faint constellation which lies between Bootes and Leo, visible in the northern evening sky in the months around March. Its brightest stars are of fourth-magnitude, forming a tight swarm close to the constellation's center. 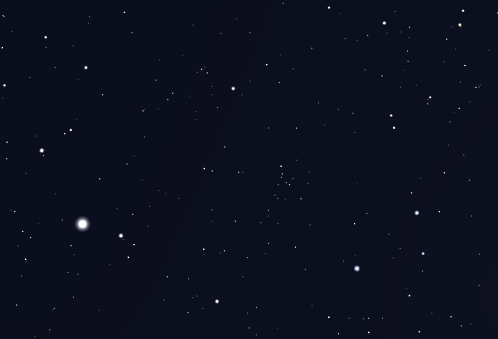 Coma Berenices was introduced by Caspar Vopel in 1536, making it the oldest surviving constellation to have been introduced since the second century. It represents the hair of Queen Berenice of Egypt, which according to legend was shaved in the third century BC in gratitude for a military victory. Its widespread acceptance as a constellation is widely attributed to Tycho Brahe, who used it in his star catalogue in 1602. In practice the association between this sky area and a lock of hair may be much older; Ptolemy described its brightest stars as a ‘nebulous mass, called the lock’ in the second century. The Virgo Cluster of galaxies – the biggest and brightest grouping of galaxies in the sky – extends across its southern border. Separately, it is also home to the Coma Cluster of galaxies, though this is considerably more distant and can only be seen with a large telescope. Coma Berenices contains the following Messier objects: M53, M64, M85, M88, M91, M98, M99, M100. Coma Berenices contains the following Caldwell objects: C35, C36, C38. 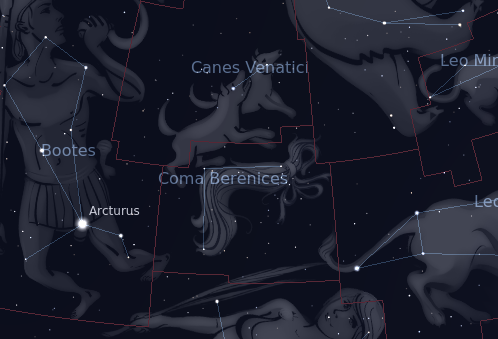 The following constellations neighbor Coma Berenices: Bootes, Canes Venatici, Leo, Ursa Major, Virgo.